We had some long, uninterrupted hours of no school going on around here, and unseasonably warm weather, so….. to combat whines of boredom, I made up an art scavenger hunt. 1. 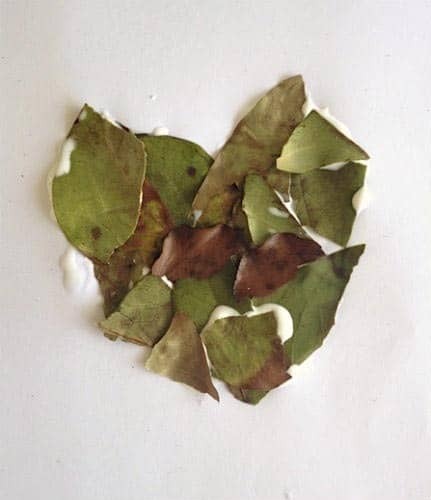 Find five leaves. Bring them home and glue them into a collage. You don’t have to keep them whole. Dry them off first if needed. 2. Trace cracks in a sidewalk with a marker, bring them inside and add lines to make a drawing. 3. Find a rock that you like for some reason. Make sure it’s not too tiny, because you will be completely covering it with chalk. Then leave it somewhere outside where someone will find it. On the edge of a sidewalk or under a park bench are good bets. 4. Go on out and make 4 crayon rubbings, with 4 different colors, on 4 different pieces of paper. Bring them inside, cut them into shapes and make a collage with them. 5. 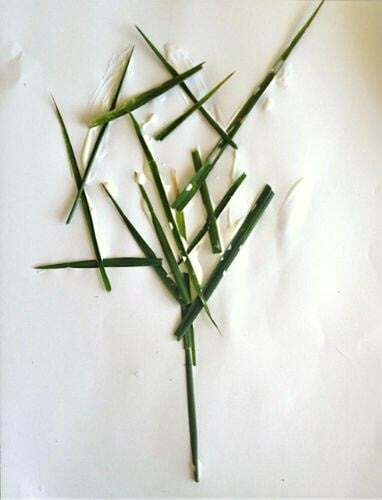 Pick 15 blades of grass. Bring them inside and make a drawing with them by gluing them onto a piece of paper. 6. Make a dirt drawing on a piece of paper. Use your finger or a stick to draw with, and don’t forget to bring a little water to mix with the dirt if it’s too dry. 7. Go find 5 sticks. 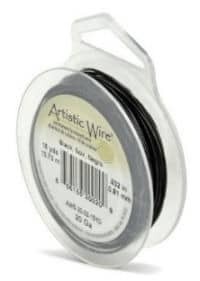 Bring them inside and use wire to make a sculpture. 8. Make a quick nature installation a la Andy Goldsworthy. Take a photo or do a drawing to document it to bring home. From the time I began this post to its posting, the temperature has dropped about 30 degrees, and Fen only actually got through 3 of these activities in one go. So I suggest having your kids do as many as they want until it becomes tedious. Maybe split them up over the course of a weekend or pull one out once in a while. 6. Make a dirt drawing on a piece of paper. Use your finger or a stick to draw with, and don’t forget to bring a little water to mix into the dirt if it’s too dry. 8. 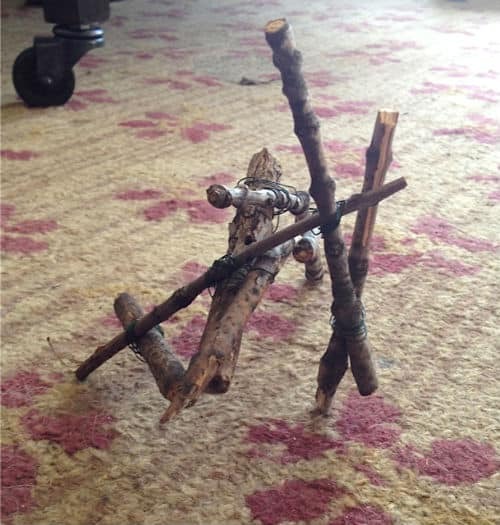 Make a quick nature installation sculpture. Take a photo or do a drawing to document it to bring home. This is great. 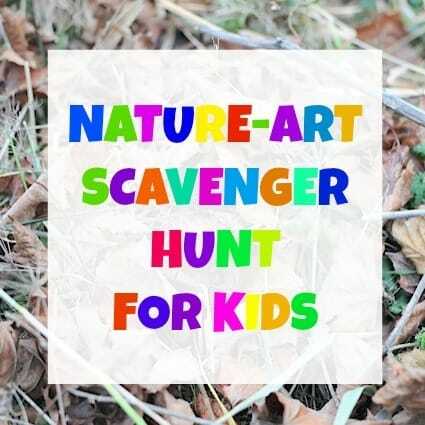 When my youngest was younger we’d have annual fall scavenger hunts with our friends at the park but never did anything with all the leaves and twigs and rocks and things that we were meant to find. How clever of you! Now if only I could go back in time and do those scavenger hunts all over again. I’m sure your scavenger hunts were pretty great. What is it that is so compelling about scavenger hunts? They’re really just so fun. This is so cool! Love it! It’s actually snowing today so we might have to wait until Spring to complete it though. Hope your weather is better!